Surprise, Arizona has everything, from retirement communities to planned family communities, and the city has numerous varied activities to suit everyone's preference. It is a beautiful suburban city with modestly priced homes, and is still within the metropolitan Phoenix area. With the city growing at the extreme rate that it is, making a real estate investment in Surprise is a great idea. 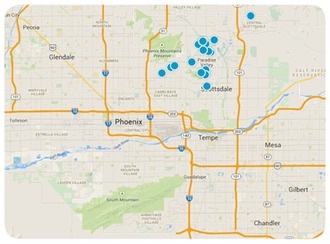 For any Surprise, Arizona real estate listing, you've come to the right place. Fill out an information form in order to check out our Online Home Finder, or search the MLS for a Surprise home. Or if you are just quickly browsing take a look at our featured properties. With the massive amounts of homes being built everyday, there are so many options to choose from that we are sure you will find a Surprise home that is ideal. As your Arizona REALTORS®, the Russell Shaw Group aims for nothing less than your complete satisfaction, so call us and let us know how we can help you find your dream home.